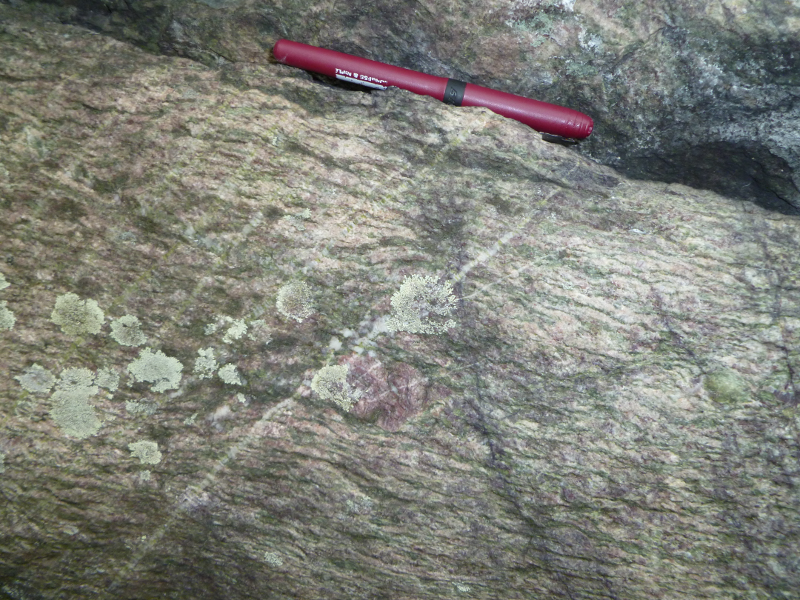 The oldest rock in Virginia, the Nellysford gneiss found in Nelson County, has been a "Cheerio" of Virginia for 1.8 billion years. 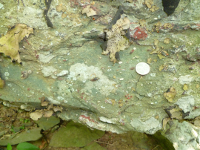 When that rock cooled into its current state, however, most of Virginia had not been created yet. About 2 billion years ago - give or take a few hundred million years - various chunks of continental crust clumped together with each other. Today, we see those chunks exposed in the central part of Canada. 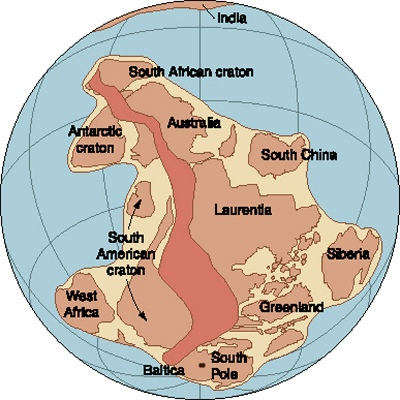 The correct buzzword for those old Canadian rocks is "North American craton." It may be easier to visualize tectonic plates as clumps of cereal (Cheerios, or Rice Krispies if you prefer...) floating in milk, rather than as chunks of continental crust floating on the molten mantle 25-50 miles below the surface. 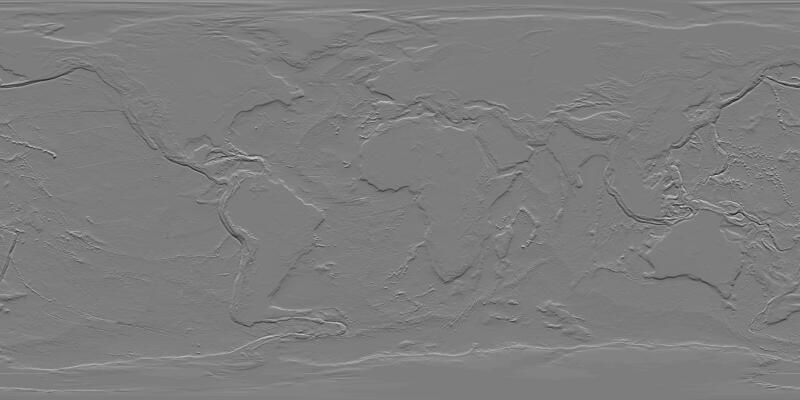 Virginia was in the middle of that Rodinia supercontinent, far from the seashore and far from rainstorms. The Virginia of a billion years ago had a "continental climate" comparable to today's Tibetan Plateau or the Gobi Desert in China/Mongolia. The Grenville Mountains and the rest of Rodinia were barren. There were no trees or plants; there was no vegetation on the land yet. Algae photosynthesizing in the ocean had already transformed the atmosphere, poisoning most of the earliest forms of life with the waste product of photosynthesis - oxygen. However, the evolutionary process had not resulted in land plants yet, so a billion years ago all of Virginia was bare rock or lakes/rivers. What goes up must come down. In geology, what goes down will also come up. Today, erosion has exposed the once-buried-deep roots of the Grenville Mountains. At Shenandoah National Park, tourists can drive and hike on the igneous rocks that were formed over a billion years ago by continental plate collisions, and then buried miles below the surface. 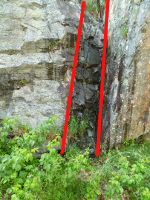 The Grenville Event - or events, because the mountains might have been created by multiple continental collisions - formed the "basement" rocks in Virginia. The heat and pressure of the collision(s) melted rocks, creating granite and gneiss. 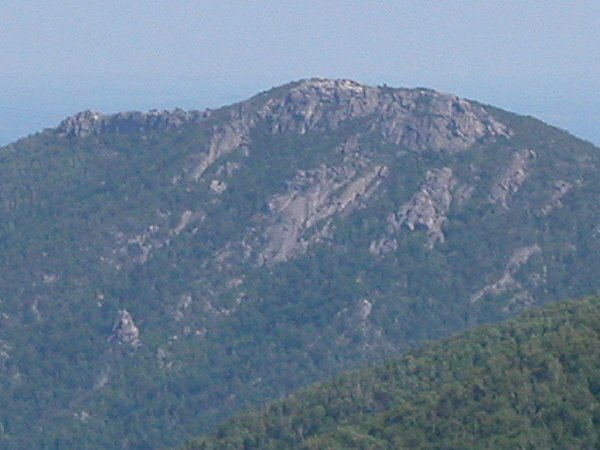 These crystalline rocks are now the core of the Blue Ridge mountains exposed in the Blue Ridge, including Old Rag Mountain in Madison County. Erosion occurred throughout the Grenville orogeny (mountain-building uplift). As rocks were exposed, they immediately began to wash away. 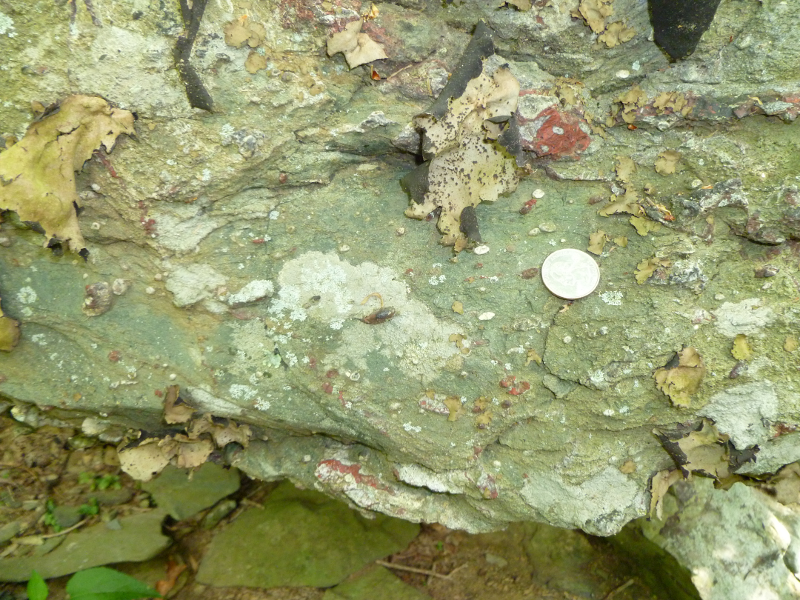 Today in Shenandoah National Park, the Swift Run Formation is a layer of sediments that were deposited on top of the ancient crystalline Grenville basement rocks. That amount of relief is close to what you see today from the Skyline Drive, looking from the crest of the Blue Ridge west towards the Shenandoah Valley or east towards the Piedmont. The Skyline Drive is nearly 4,000 feet high in places... but the adjacent territory is also about 2,000 feet above sea level. Roughly 400 million years after the Grenville Event, the continental plates pulled apart. The supercontinent of Rodinia had trapped too much heat, or perhaps the molten mantle underneath the crust bubbled a little (think of a spoon swirling the milk, pulling apart the clump of Cheerios). 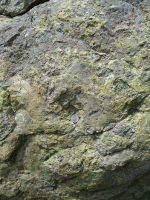 Multiple cracks formed in the crust of Rodinia, and then one developed as a "spreading center" with magma welling up in the middle of that crack. The rising magma broke apart Rodinia, cracking it into multiple plates and pushing the North American plate away from the others. Debris from ridges on both sides of the crack eroded into the widening basin until, at some time, salty ocean water flowed in and a new ocean developed. 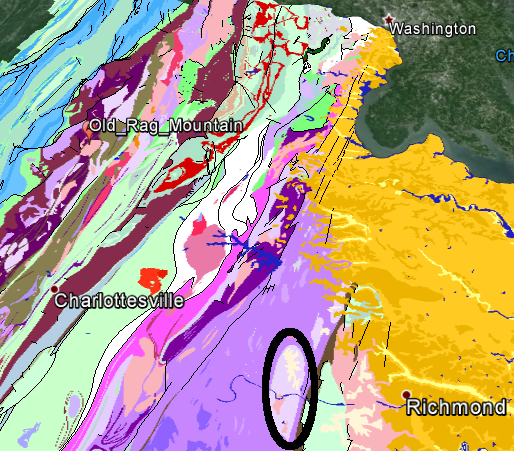 Slowly, Virginia finally emerged on the coastline of the North American craton instead of being in the middle of Rodinia, smushed together with all the other continental plates. That ocean is known as the Iapetus. In Greek myths, Iapetus was the father of Atlas. Since the Atlantic Ocean is named for Atlas, the ocean that existed before the Atlantic is called the Iapetus. This bumping and bouncing by continents is still going on today. The Rift Valley in East Africa is a crack that's still all dry land, but you can see the ocean invading between Africa and Arabia in the crack that we call the Red Sea. 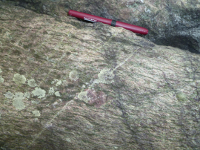 In geology, present conditions are a key to the way rocks have moved in the past. The shapes of the continents and oceans change, but the geologic processes that build/destroy mountains have been constant for billions of years. Some of the basalt lava on the east side of the Blue Ridge appears to have erupted under water. What water? It would have been the Iapetus Ocean, filling in one of the cracks that formed as the "Cheerios" of Rodinia drifted apart, or a temporary lake that formed in a great crack in the surface of the earth. Basalt is a volcanic rock that is relatively low in quartz (silica), and can flow fast compared to silica-rich lava. 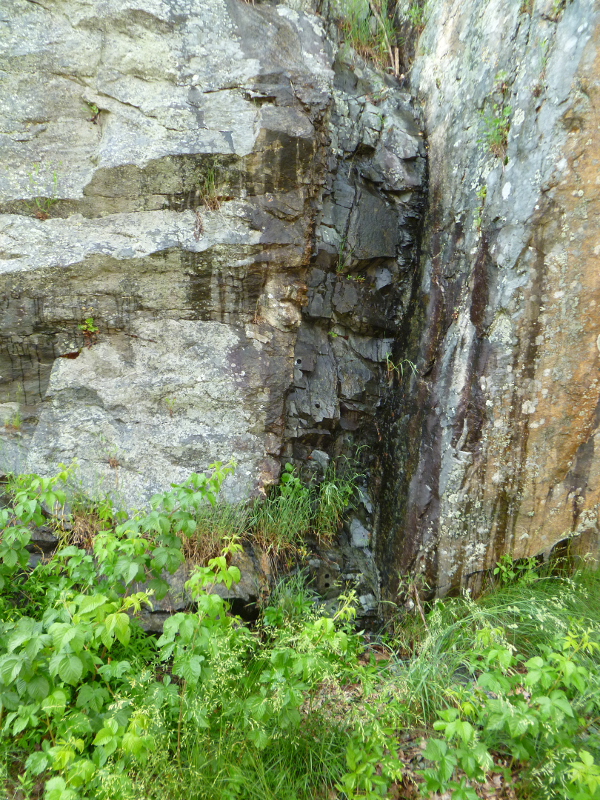 The individual basalt flows in Virginia 600 million years ago may have moved at unusually rapid speed, as the magma shot up through the Grenville-age rocks and then flowed across the surface. How do we know the speed of flow? The remaining dikes (the channels cut through the overlying sediments as magma moved up) are narrow. 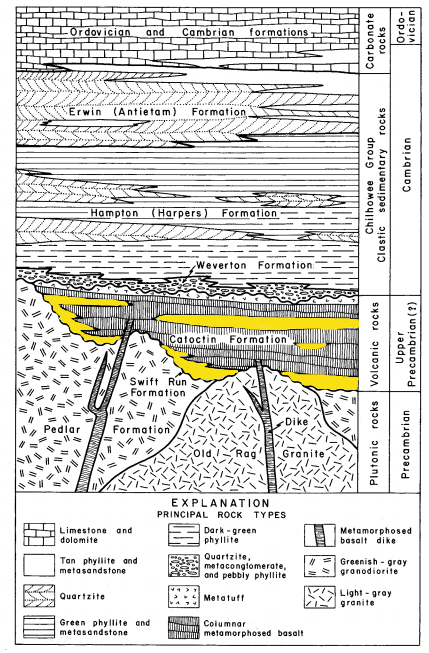 Slow-moving magma would have congealed and blocked those channels before transmitting enough molten rock to create the broad expanses of Catoctin basalt. At roughly the same time as the basalts were erupting, a volcano spewed a vast amount of lava near what became the North Carolina border. Later, that hard volcanic rock would be buried and exposed again by erosion to become Virginia's highest point, Mount Rogers. The Catoctin basalt would also be buried and metamorphosed by heat and pressure, realigning atoms and creating new minerals. 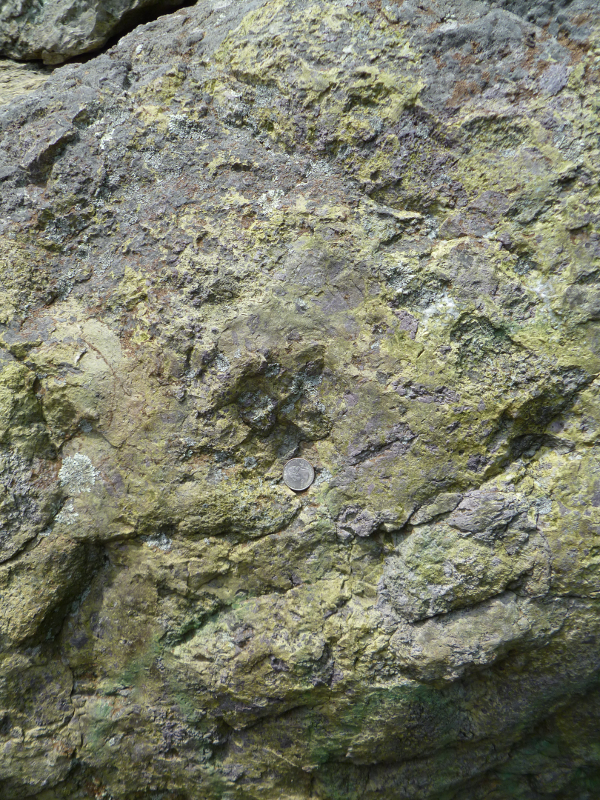 Today, there is so much epidote (a green mineral) in the metamorphosed basalt that it its known as "greenstone." If you hopped in a time machine and went back 600 million years to stand at Old Rag Mountain in Shenandoah National Park and looked towards what is now West Virginia, you would see a flat plain of black volcanic rocks. If you looked in the other direction, you would see Iapetus Ocean waves crashing at the base of the volcanic rocks. What today is Richmond would have been underwater. 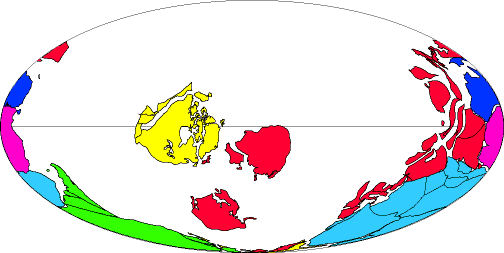 Source: US Geological Survey (USGS), Color-coded Continents!